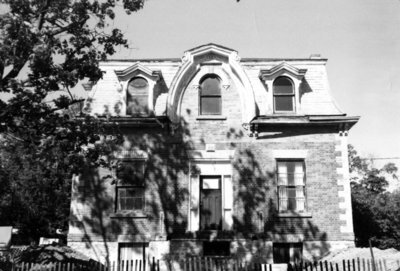 A black and white photograph of the Thomas Holmes residence during renovations. This house was located at 408 Byron Street South. It was built in 1853 as a one-storey Regency cottage. A Mansard roof designed by Henry Langley, Toronto Architect, was added around 1875. This is a front view of the house. Thomas Holmes House, Date Unknown, Photographer Unknown. Whitby Archives A2013_015_001.